Calne Archers is a new club, with a relaxed and friendly approach to target archery. We have eight qualified instructors, more than enough to help get people started and to develop the right techniques to get shooting as quickly as possible. Whilst maintaining the necessary disciplines for safety and correct shooting, we are as focused on having fun as trying to maximize our scores. We are as likely to shoot as teams as individuals. We are very fortunate in our use of Beversbrook, as we are able to shoot all year round (weather permitting), on our own dedicated range. A4 Information Leaflet download: New leaflet being produced. Beversbrook Sports Facility is situated toward the eastern end of the A3102 Bypass (Beversbrook Road), to the north of Calne. 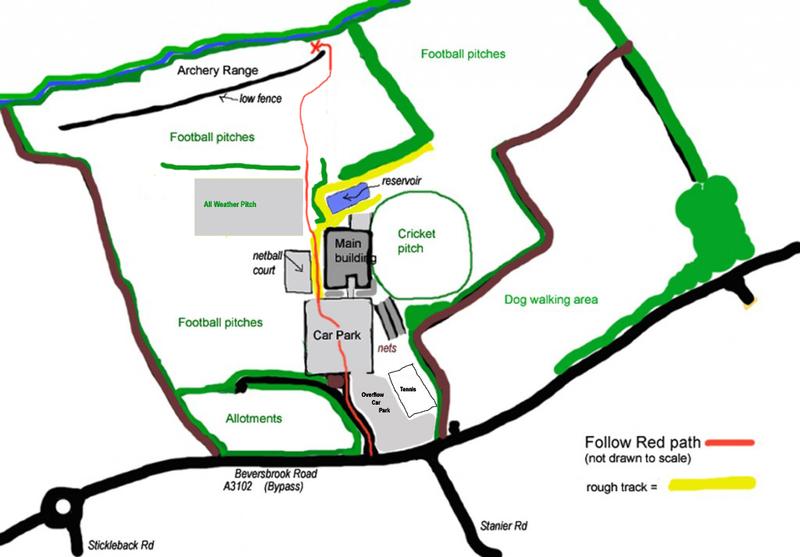 From the car park take the rough track to the left of the main building (community hall), and follow it to the All Weather Pitch where there is a tarmac footpath to the right of the pitch. Follow this to a small bridge and our range is across the football pitches – you will see a low fence, behind which, you will find our target archery range. Make for the right hand end of the fence where the waiting area and shooting line is situated. If the car park is full due to the many football matches on at a weekend, then you may be able to find space somewhere on Stanier Road almost opposite the Beversbrook entrance.